Extreme resistance to cuts, splinters and burrs. The PowerFlex® 80-658 glove protects the wearer with a triple-layer construction that comprises steel, glass fiber and Kevlar®. The glove exceeds EN388 cut level 5. Extra-long cuff offers extended safety for the forearm. The PowerFlex® 80-658 glove is ¾ dipped and liquid repellent, shielding the skin from unpleasant liquid solutions. Good heat contact resistance. EN407 level-2 rating means safe handling of warm objects. Natural rubber crinkle finish provides a firm grip. 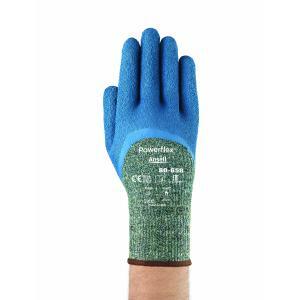 Long life makes the PowerFlex® 80-658 glove a highly cost-effective solution. Heather green colour helps mask dirt. Excellent washability, with no decrease in comfort or fading.